From the ashes of “Raw Meat” (an earlier, “rock/noise” 2-man group, with musicians Steve Gore, and David Johnson; operating during the late 1960’s/early ’70’s), rose the Rascal Reporters in 1974. Steve Gore remained; David Johnson was replaced by Gore’s high school buddy, Steve Kretzmer. Both musicians shared similar interests in life and music, both were composers and musicians, and both just happened to play keyboards and drums. A perfect musical union was formed that continues to this day, and beyond. Both Steve’s were born in 1958 and raised in suburban Detroit (Oak Park, Ml). Both Steve’s left-handed. During the years 1975 and 1976, the group literally were writing and recording one song per day, everyday, throughout both years. A 12-CD box-set of unreleased music could be culled just from these two years alone. Steve Gore, renowned for never erasing any piece of music from any tape at any time or any year, was largely responsible for the existence of the 30-year “bottomless” tape vault known as the “RRkives.” The first attempt to “go public” was in 1978, with a planned 45rpm picture-sleeve release, “My Name“/”Ricky And His Dad.” The release was cancelled due to lack of funding (though appear on the “The Foul Tempered Clavier” album as bonus tracks). 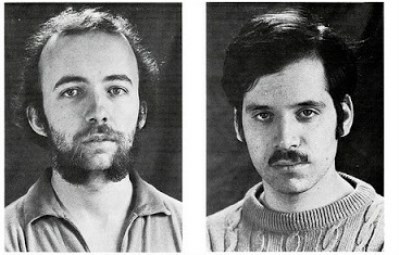 Public exposure finally came in 1980, when Archie Patterson of Eurock then based in California, released the Rascal Reporters’ full-length “cassette album,” “Freaks Obscure” to the world. This was one of Eurock’s very first releases in the relatively new era of “group self-produced albums on cassette.” This was immediately followed-up with “We’re God,” also a Eurock cassette release, and also issued in 1980 (now on CD Baby & Spotify). These two releases established a small, but strong world-wide cult following for the band. People suddenly wanted to hear more of this strange, bizarre, often obscene (“Freaks Obscure”), though definitely rooted in the British Progressive Rock movement of the late 70’s, Rascal Reporter music. The group issed a 45rpm single in 1981, “Guns For Jerry’s Kids” / “Beatrice” (available as bonus tracks on We’re God), and a landmark LP in 1984, “Ridin’ On A Bummer” (CD Baby / Spotify), which boasted guests Fred Frith, and Tim Hodgkinson; their first reuniting since the break-up of their group, Henry Cow, in 1978. The Reporters’ popularity increased greatly after this release. The Rascal Reporters’ legacy was permanently cemented in 1988, when they released their “masterwork,” “Happy Accidents” LP (CD Baby). The musicians they loved and were influenced by, were suddenly becoming their friends. As such, the LP. boasted guests, Guy Segers of Belgium’s “Univers Zero“, Nick Didkovsky of New York’s “Doctor Nerve,” Dave Newhouse of “The Muffins” (a very frequent contributor to their work; almost a “third member” of the group), Steven Feigenbaum, CEO of the Cuneiform Records label and Wayside mail-order company, playing his final-ever musical performance (guitar) on an album, David Kerman, of “5uu’s,” “U-Totem,” and guest drummer on far too many CD’s to list here, James Grigsby, leading composer for the group “U-Totem,” as well as Steve Kretzmer’s virtuoso bass guitar-playing older brother, Paul Kretzmer, who has been an RR “3rd” member on and off for 20 years. “Happy Accidents” sold out quickly and audience demand for more became greater. Up to this point, all music was released on the group-owned label, “Hebbardesque.” Neither of the two Steve’s are able to “read or write” music in the formal sense. All music is composed by ear, and the “rote-repetition” discipline. It is certainly a bizarre coincidence that both musicians play keyboards and drums (Steve Gore being a stronger drummer; Steve Kretzmer being a stronger keyboard player), and compose music. Another very odd method of the group is this: The majority of the music is both completely composed and performed by only one of the two members at any one time. Basically, two “one-man bands” working together, forming a unique “Four-man band” comprised of two individual musicians with differing, but complimentary composing styles. Inviting guests to record with them is difficult. The music is so complicated, that the guest must be able to “reach music that the RR’s don’t know how to “write” out. The best-case scenario involves guest musicians who can both read music, and also play by “ear”. The Reporters 90’s output comprised of 1995‘s “Purple Entrapment” (CD Baby / Spotify), which was released on CD via Wafer Face. This release saw the Steves’ sound turn to more digital and electronic textures, presenting an almost Muzak like twist on their sound at points, but also with more “song”-driven and vocal-led tunes. In 2001, “The Foul-Tempered Clavier” (CD Baby / Spotify) was released on CD by Pleasant Green Records. This release saw the band eschew vocal material and back to Happy Accidents’ instrumental approach. The sound on this album harkens to the likes of “Uncle Meat” by Frank Zappa and his later “MIDI” years. It features numerous contributions from Dave Newhouse on horns, and closes out with one vocal piece, “Tomorrow”, reminiscent of The Beatles in an alternate universe. The most recent Rascal Reporters full-length album is 2008‘s “The Mind Boggles” (Bandcamp), written and recorded mostly by Steve Gore during a time where Steve Kretzmer was taking a break from music, though Kretzmer writes and performs on 3 tracks from the album, along with guests Mark Harris (“Thinking Plague“, “Hamster Theater“) on saxophone, keyboardist Michael Sahl (Judy Collins, Van Dyke Parks), and enigmatic bassist Bob Shirley. In 2009, news came that Steve Gore had unfortunately passed away, and it seemed as though Rascal Reporters may have come to an end. For the first half of the 2010s, the massive collection of Rascal Reporters archived reel-to-reels, DATs and cassettes were being digitised by Brian Donaghue, with never before heard material being made available via Bandcamp. The music was faithfully remixed and remastered by Brian for compilation releases and single / EP releases, such as the 2012 release of the never before heard full length version of “Psychlops“, which had been teased in excerpts as bonus tracks throughout the band’s career. Also released was the Steve Kretzmer 1986 solo EP “Oil of Lavender“, Steve Gore’s “The Human Chain” from 1983, a rare live recording of the band performing in high school in 1976 with an Egg-like Canterbury sound “Elegant Decay“, and an expansive 36-track compilation “Nice Not To Be Here” featuring entirely never-before-heard material from throughout the bands history. In late 2018, Steve Kretzmer released his first new music in 18 years, a new Rascal Reporters single “Unknowable” / “I Cries Crimes” (Bandcamp / CD Baby), featuring guests Guy Segers of “Univers Zero“, Kim Sajn of “Polyethylene Pet/+1” and Dario D’Alessandro of “Homunculus Res“. These singles were released in preparation for a forthcoming new studio album, “The Strange Case of Steve” (TBA), and pushed the Rascal Reporters sound into new directions, with new sonic textures never seen in their music before, and fresh ideas and inspiration. The Rascal Reporters’ major musical influences include: The Beatles, Frank Zappa, Gentle Giant, Egg, Hatfield and the North (and off-shoots), Henry Cow, Soft Machine, The Residents, Gryphon, The Enid, Stackridge, Univers Zero, Art Zoyd, Tipographica, The Muffins, Burt Bacharach, Bela Bartok, The Archies, PFM, Van Dyke Parks, Brian Wilson, Judy Collins, U-Totem, Bread, The Regeneration, Herman Szobel, Krzysztof Komeda, Genesis, Magma, etc.